Mobile Mapping Market Size « Global Market Insights, Inc. The increasing importance for geospatial technologies for visualizing and analyzing geospatial data has stimulated mobile mapping industry trends. The advent of new technologies such as Lidar, AI, and IoT has also significantly transformed mobile mapping technology over the last few years. With more innovations across this technology, it has become easier and effective to carry various tedious projects like urban development, rail-road creation, and power plant construction across inaccessible areas. Thus, the increasing use of this technology to survey numerous mobile platforms is poised to propel mobile mapping industry share. The involvement of companies in novel product development activities for high efficiency and productivity will have a notable impact on the business over the years ahead. In the last few years, companies have come up with a diverse set of products that can deliver remarkable benefits to users and asset owners. Validating the aforementioned fact, in February 2018, the California based software development company, Trimble developed a next-generation mobile mapping system, which has been designed with multi-camera imaging, mobile lidar system, and field software. This newly launched Trimble MX-9 mobile mapping technology has the capability to capture 360-degree immersive geo-referenced imagery with the help of already installed laser scanning sensors, GNSS technology, and spherical camera. The improved accessibility of such newly developed mobile mapping devices via smartphones and tablets will augment the growth of mobile mapping market. Speaking more about the recent advancements, it is prudent to mention that 3D mobile mapping is also one of the latest developments in geospatial technologies that helps users to record, measure, visualize, and understand environments. The advent of 3D mobile mapping has overcome the limitations of conventional mobile mapping systems and helps to carry out a detailed visualization of climatic conditions. In 2018, a German company which develops software and hardware to navigate, map, and digitize the indoors, NavVis made it to the headlines for generating a fully integrated product for indoor mapping aided with six cameras. NavVis has developed this product in accordance with customers’ request to have sophisticated and more versatile systems. This product is likely to prove beneficial for the end-users like construction product manufacturers, construction companies, and AEC (architecture-engineering-construction) professionals to generate high-quality data owing to its capability to capture immersive imagery. The increasing importance for geospatial technologies has also been encouraging the players in the mobile mapping market to carry out vigorous research and development activities for capturing more business space. For instance, the Italy based SITECO Infomatia SRL has been proactive in developing varieties of products from road-scanners to pave-scanners. In 2018, it has launched software assisted mobile mapping devices. The integration of software and LiDAR system has helped the company to enhance the performance of mobile mapping platform. 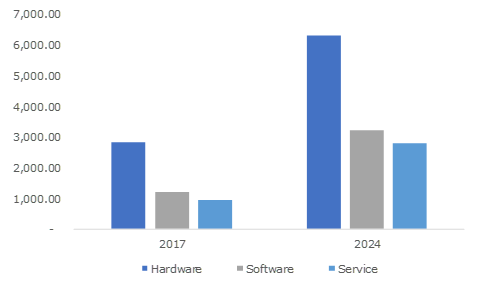 The widespread availability of multi-scanners and high-performance mobile mapping platforms is slated to propel the industry growth over the years ahead. In addition to higher performance, cost-effectiveness is also one of the major factors promoting mobile mapping market size. As of now, Google is one of the leading contributors of navigation applications, but due to rise in subscription amounts for accessing its Google Maps, other contributors in mobile mapping market have been able to race ahead with the launch of low-cost navigation features. For instance, a few days before, a digital mapping company, TomTom has started offering free software development kits to Android and iOS users to access maps and traffic information for free. Such initiatives will help IoT companies and autonomous vehicle manufacturers to load the traffic and routing data free of cost. The advancement in consumer electronics and shifting trends toward the deployment of autonomous vehicles for the betterment of the environment will have a positive influence on the mobile mapping industry share. As of now, most of the automotive companies have been involved in the development of highly modernized infotainment systems for improving the driving experience that is likely to enhance the product demand. In accordance with the expanding end-use sectors, the strategies adopted by the key player will help them to strengthen their business position over the years ahead. Reportedly, driven by new product launches, mobile mapping market will generate a revenue more than USD 40 billion by the end of 2024. This entry was posted in Sustainable & Smart Technologies and tagged Agriculture, Asset Management, BFSI, Consulting, Data Processing, GIS Data Collection, Government & Public Sector, Imaging Device, Integration & Maintenance, Laser Ranging Device & Scanning Device, Managed Service, Mapping Data Extraction, MINING, Mobile Mapping Market, Mobile Mapping Market Size, Positioning Device, Real Estate, Retail, Road & Railway Survey, Telecommunication), Transport & Logistics, Vehicle Control & Guidance.